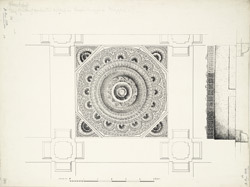 Pen-and-ink drawing of a bay of ceiling over the central mihrab in the Queen's Mosque in Mirzapur, Ahmadabad by James Burgess (1832-1916) between 1884 and 1886. This image is from an album of 47 drawings of plans, sections, elevations, sculpture and architectural details from monuments and sites in Ahmadabad and its neighbourhood c.1884-1886. They were prepared mainly by Indian draftsmen under the supervision of James Burgess (1832-1916) of the Archaeological Survey of India. The city of Ahmadabad was founded in 1411 by Ahmad Shah, Sultan of Gujarat, on the site of the village of Asaval on the eastern bank of the Sabarmati river. The dynasty ruled until 1537 when Sultan Bahadur Shah was killed by the Portuguese at Diu. Gujarat was annexed by the Mughal emperor Akbar in 1572. Rani Rupavati’s Mosque is situated in the Mirzapur district of Ahmadabad. It is believed to have been built during the reign of Muzaffar Shah II (1511-26). Rupmati was Princess of Dhar (Madhya Pradesh) and the Sultan’s Hindu wife. The mosque, like many in the city, incorporates elements of both Hindu and Islamic design. There are three domes on the roof. The central dome is raised to allow space for an upper gallery though which additional light can enter the mosque. This arrangement of an upper gallery around a central domed rotunda is derived from local Hindu and Jain temple design. The elaborately carved minarets which flank the central arched entrance to the mosque sanctuary were truncated in the earthquake of 1819. The carvings in the gallery and the mihrabs are particularly attractive. This drawing shows the carved ceiling panel directly over the central 'mihrab' or prayer niche.